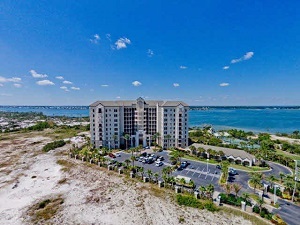 Perdido Key Florida waterfront condo for sale at Florencia.Very popular 3BR/3BA floor plan, beautifully furnished and decorated. #607 being sold furnished and rent ready with gorgeous unobstructed views of Ole River and Intracoastal waterway. Florencia is contiguous to the Perdido Key State Park creating a private beach on Ole River and Gulf beaches just a short distance. Gated unparalleled amenities with beautiful walking areas, indoor & outdoor pool, owner's club with exercise gym, tennis court and bike trails just outside gated entrance to Lost Key golf course and Holiday Harbor Marina. This is a destination area convenient to all areas.